…if Plaintiff Welden’s brief and simple complaint is heard in the same proceeding as other Plaintiffs’ testimony and arguments, it will be buried like a needle in a haystack of mind-numbing legal wrangling. 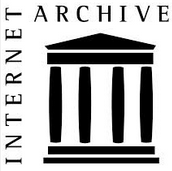 If anyone has copies of the submissions by the other Challengers, please leave a comment and I will link to them. Cody Judy, you may remember, filed a lawsuit against John McCain in 2008, and maintains a web site promoting his candidacy for President. I found that there are two pre-trial orders from Farrar. One states that Orly’s case will take 30 minutes to present. The other says 6 hours. That latter document lays out in more detail what case she will present. In addition to a full list of the cases being heard this month, there have been other omissions from my coverage. One is a request to appear amicus curiae (as a friend of the court) by Paul Andrew Mitchell who describes himself as “Private attorney general.” Mitchell filed papers in previous cases, including Berg v. Obama. He appears to run a web site called the “Supreme Law Firm” although it was not readily apparent from the web site where he is licensed to practice law. In his motion to Judge Malihi, Mitchell references his aptly-named paper “Citizenship for Dummies” in which he claims, among many other things, the 14th Amendment was never properly ratified. While I didn’t read in detail the lengthy, rambling and convoluted papers written by Mr. Mitchell, I think that perhaps what he is trying to say is that since the 14th Amendment is invalid, they the Supreme Court decision in Scott v. Sanford is controlling and that apartheid is the law of the land, making Barack Obama not a US Citizen (never mind that Obama is not descended from African slaves). At least one other filing has been made outside the listed challengers from Dr. Paul Maas Risenhoover who argued that a disbarred attorney might be ghostwriting papers for Orly Taitz, in violation of court rules in some jurisdictions. Further Risenhoover states that Obama is only a natural born citizen only if Hawaii is indeed a state, and not the occupied territory he thinks it might be. The occasional open thread: death to robocallers edition. As I recall, the 14th Amendment Voiders (if I can coin a term), argue that Ohio was not actually declared a State until the 1950’s or something like that due to an oversight (which is incorrect, but anyway…). Since the Ohio approval was the one that tipped the 14th over the edge, they claim it was never validly ratified. This argument overlooks the fact that there were, I think, three other States, that ratified the 14th ON THE SAME DAY. Then there is the crew that found the Texas School book with a different 14th Amendment due to a publishing error (the publishers jumped the gun and assumed an amendment would be ratified – it never has been). Therefor everything based on the 14th amendment is null and void because the one they are talking about is the 15th Amendment, but it was ratified properly because Ohio wasn’t a State, etc, etc, etc. The Amendment the Texas Schoolbook incorrectly lists discusses banning titles of nobility. It fell one or two States short at the time, but the last State to ratify it was New Hampshire in 1812, so the bar has been raised considerably since then. Apparently the publishers of that schoolbook fell victim to the widely held, but mistaken, belief that both houses of the Virginia legislature ratified the bill, when it hadn’t. As there is no time limit, someone tries to get folks interested in it every once in a while. I’ll look for the others but from memory they are very similar, apart from the Orly Farrar case of course. I may have missed something, but how again is Orly representing clients in Georgia? Did she get pro haced, and I missed it? Rather than complaining about “ghost writers” that may be prohibited in “some jurisdictions” can someone tell me if Orly is illegally practicing law in Georgia? Keith: As I recall, the 14th Amendment Voiders (if I can coin a term), argue that Ohio was not actually declared a State until the 1950′s or something like that due to an oversight (which is incorrect, but anyway…). Since the Ohio approval was the one that tipped the 14th over the edge, they claim it was never validly ratified. Oh, goody. I get to present a little history of my native state. Ohio was carved out of the Northwest Territory. It was the 1st state to enter the union out of Federal territory (as opposed to being carved out of an existing state — KY was originally part of Virginia and Vermont was part of New York). Consequently, the sequence of events needed for statehood got messed up on the 1st try. Long story short, Congress authorized Ohio to apply for statehood. When they presented their state constitution for congressional approval, Ohio claimed a northern border that was different than Congress authorized (due to map errors). Congress recognized the errors, and decided to table the issue until it could be figured out. Congress finally addressed the border issues in the 1830’s, without realizing they still hadn’t passed a bill admitting Ohio to the union. THAT problem wasn’t corrected until historians — preparing for Ohio’s sesquecentennial in 1953 — found the error. Congress passed a bill retroactively admitting Ohio to the union as of 1803. There is also Blanchard who filed a FOIA and complaint with Kemp. Sounds almost like shades of the Barry Goldwater Presidential eligibility question. For those who don’t recall, Goldwater was born in Arizona Territory. He was certainly a citizen by birth but there were questions of whether or not being born in a territory made him a natural-born citizen. Hatfield’s two cases are consolidated (Swensson and Powell). From Hatfield’s motion to sever from all the other cases but remain consolidated with each other it can be seen that his focus is on the contention that Obama is not a NBC. That could he mean he will concentrate on the birth place issues or the two citizen parent issue or both but he clearly wants to distance himself from Orly’s SSn stuff etc. So it’s only actually 3 hearings for the cases you listed. JoZeppy: I may have missed something, but how again is Orly representing clients in Georgia? Did she get pro haced, and I missed it? Rather than complaining about “ghost writers” that may be prohibited in “some jurisdictions” can someone tell me if Orly is illegally practicing law in Georgia? Think she did get PHV and she has indicated that she will be assisted by a so far unidentified lawyer of 20 years experience, who will probably transpire to be the sucker who vouched for her. Than you! I have added this information to my article. Here is Weldon’s Oppositition to the Motion to Dismiss. Oddly enough this was linked in a comment to the Marquette University Law School Faculty Blog. In an article about President Chester Arthur. Van Irion is a patent attorney, so he appears to be a bit out of his element. He also is very young, having received his J.D. in 2005. Georgia is having a big affect in Birferstan, Birthers are giddy at what they believe to be their final success. The delusions are higher than normal, but birthers have short memories, they forget all the previous failures and shoot for the next OMG moment. What they should do is search for a good therapist. Obama owns Orly’s brain. “Obama” is all she thinks of. She is his slave. Are they going to try a challenge in Indiana this time? Vice president Curtis was born in Kansas territory. Not a problem. But then President Arthur had an Irish father. Funny how the same things keep coming around. y_p_w: Sounds almost like shades of the Barry Goldwater Presidential eligibility question. For those who don’t recall, Goldwater was born in Arizona Territory. Paul: THAT problem wasn’t corrected until historians — preparing for Ohio’s sesquecentennial in 1953 — found the error. Congress passed a bill retroactively admitting Ohio to the union as of 1803. My understanding is pretty much as you say, however, there is no doubt that Ohio was a State all along, the arguement was over which act on which date actually made it one. The State was having difficulty figureing out when its sesquecentennial actually was. All the 1950’s bill did was officially recognize one of the three candidate dates as the date. (1) The argument about the Prez’s father not being a citizen is a red herring. US law is very clear that a child who is born in the US is a native-born citizen of the US – even if both parents are non-citizens and never become citizens. The was so held in the case of a child born in the US to British tourists; Lynch v. Clarke (NY Chanc. 1844) 1 Sandf.Chanc. 583, 3 NY Legal Obs. 236, 7 NY Chanc.Annot. 443. This case was cited when the US Supreme Court said the same about the child born here of Chinese parents; US v. Wong Kim Ark (1898) 169 US 649, 18 S.Ct 456, 42 L.Ed 890. Also relied on by the US Attorney General; 10 Op. US Atty-Gen 328 (1862). We also have the example of the 21st President, Chester A. Arthur (1881-1885), born in Vermont to a US citizen mother and a British father. 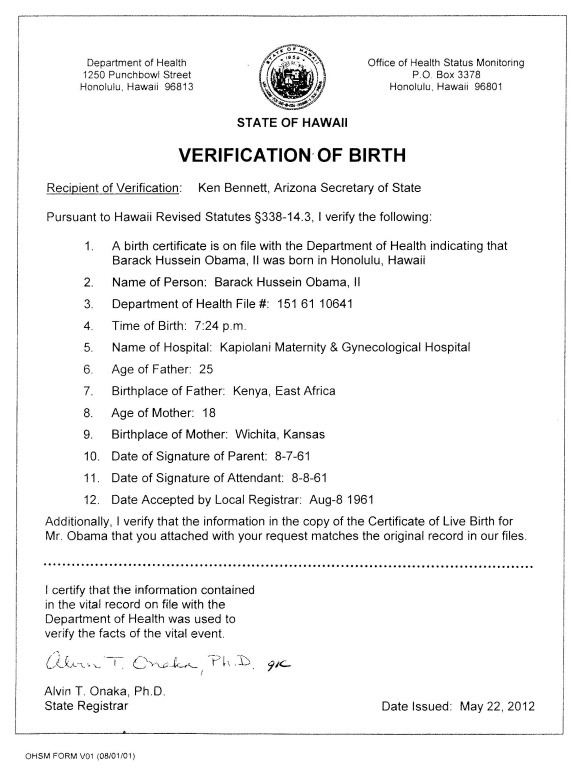 (2) Even if Hawaii had not been a state when Obama was born, it was, prior to statehood (Aug. 21, 1959) a US territory and this is considered sufficient, especially since Hawaii eventually became a State. For example, Barry Goldwater, the Republican candidate in 1964, had been born in the Territory of Arizona before it became a State. But Obama was born in Hawaii after it attained Statehood and that status is pretty safe. 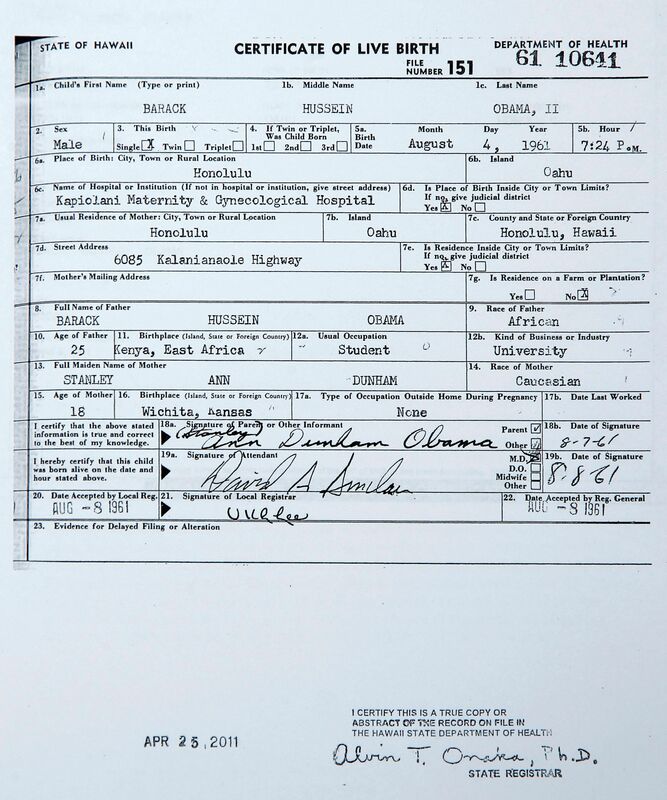 The Minor v. Happersett decision was misrepresented by birthers (who usually miscited it). It did not say that a child must have Both Parents already US citizens in order to be a US native-born citizen. It only said that it was undoubted that a child born in the US to two US citizens was a native born citizen … and since the case in front of it did not present any different fact situation the court was not going to delve into any other possible permutations. 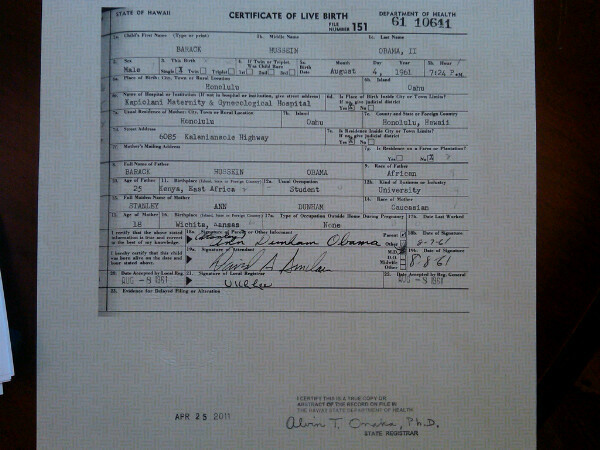 You’d make a lousy birther. Bernard: (1) The argument about the Prez’s father not being a citizen is a red herring. Finally a visitor who appears to understand the legal foundations. Welcome. Judge Mental: Think she did get PHV and she has indicated that she will be assisted by a so far unidentified lawyer of 20 years experience, who will probably transpire to be the sucker who vouched for her. (2) Nonresident attorneys who are not active members of the State Bar of Georgia may be permitted to appear before an Administrative Law Judge in isolated cases upon motion to and in the discretion of the Administrative Law Judge. A motion to appear in a particular case shall state the jurisdiction in which the movant regularly practices and state that the movant agrees to behave in accordance with the Georgia standards of professional conduct and the duties imposed upon attorneys by O.C.G.A. § 15-19-4. Glad to see a fellow Ohioan here! Great historical recap, thanks! Oh and yes, 2003 was a big deal in our state, celebrating our bicentennial, so everyone accepts 1803 as Ohio officially being a state since then. richCares: Georgia is having a big affect in Birferstan, Birthers are giddy at what they believe to be their final success. The delusions are higher than normal, but birthers have short memories, they forget all the previous failures and shoot for the next OMG moment. What they should do is search for a good therapist. I’d suggest eye protection against flying tooth chips. Many teeth will be a’gnashing! Will this all build to a frenzy as the election nears, or will the spirits of the birther break, as they resign themselves to a life of tyranny? If the latter, expect a run on Häagen-Dazs� in late summer. Agreed on the teeth gnashing, for sure! You bring up a very valid point about what happens to Birtherism this year… it really seems that their furious efforts to hit this issue so hard early on is only serving to do themselves in quicker. They’ve invested so much “OMG” false hope and intensity into these various early attacks that they’ve pretty much shot their wad and are setting themselves up for a harder crash than any of their previous EPIC FAIL efforts. I seriously wonder how much steam they’ll have left in their sails by the time Haskin’s Birther Summit rolls around in a few months… it is likely to turn into the saddest self-pity party one can imagine. Of course, no one will be surprised if many of the die-hards just double-down even more into denial and just scream “treason” in ever more shrill voices. Heck, we’ve seen that from every loss and embarassing failure they’ve put forth so far. …But beyond tantrums, what will they have left, after this? Their ability to endlessly shoot themselves in the foot is only serving to kill their ability in the courts more and more each time. They are in serious danger of getting that door closed and slammed shut on them completely. Once any court accepts the COLB, that is pretty much the end of the road for them. I don’t see where the General Election will provide them any new opportunity to pull these stunts, once that happens. As we are also likely to see an increase in sanctions towards their efforts, that too should finally start blunting these frivolous attempts. JPotter: I’d suggest eye protection against flying tooth chips. Many teeth will be a’gnashing!Will this all build to a frenzy as the election nears, or will the spirits of the birther break, as they resign themselves to a life of tyranny? If the latter, expect a run on Häagen-Dazs� in late summer. A failure in Georgia will NOT slow them down. The conspiracy will simply expand to accommodate the new reality. I’ve thought several times before that we were witnessing the death of birtherism. I was certain that Trump’s Farah talking points media tour that crescendoed into the White House releasing the LFBC would be the end of at least the BC birthers, but then they discovered “layers”…and they were off and running…again. And Orly’s failures only serve to reinforce the belief that powerful dark sinister forces are aligned against her. Don’t get me wrong – I certainly don’t expect them to learn their lessons or this to be the end of Birtherism. Heck, the Flat Earth Society is still going, even though their nonsense was debunked over four centuries ago! I’m just saying that their court-based avenues are quickly running dry…all due to their own efforts in pursuing them so vigorously, yet poorly. Bill DuBerger: A failure in Georgia will NOT slow them down. The conspiracy will simply expand to accommodate the new reality.I’ve thought several times before that we were witnessing the death of birtherism. I was certain that Trump’s Farah talking points media tour that crescendoed into the White House releasing the LFBC would be the end of at least the BC birthers, but then they discovered “layers”…and they were off and running…again.And Orly’s failures only serve to reinforce the belief that powerful dark sinister forces are aligned against her. As I recall, the 14th Amendment Voiders (if I can coin a term), argue that Ohio was not actually declared a State until the 1950′s or something like that due to an oversight (which is incorrect, but anyway…). Since the Ohio approval was the one that tipped the 14th over the edge, they claim it was never validly ratified. 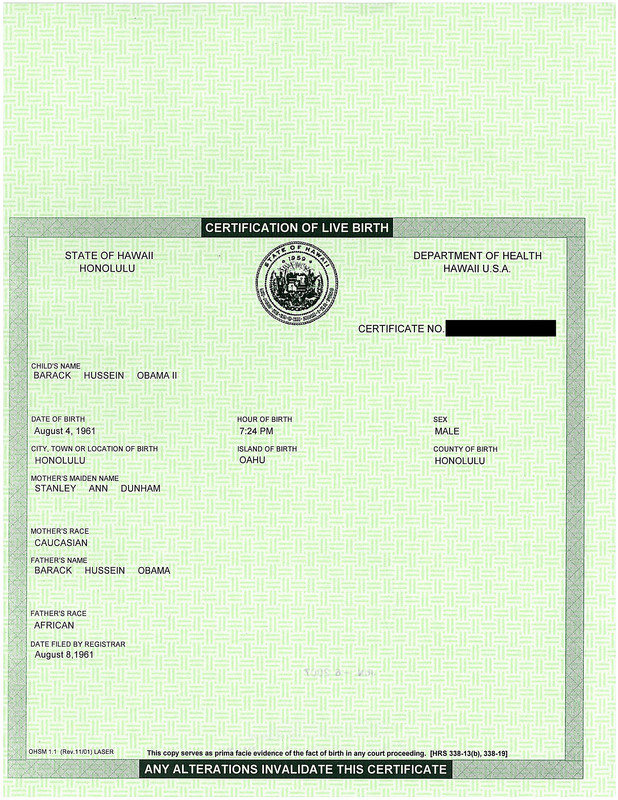 I have certainly heard birthers explain that the 14th amendment was never ratified properly because Ohio never was a proper state, but that is basically a red herring inside the entrails of a red herring (I do not know whether in the real world red herrings are cannibalistic, but birferism does not exist in the real world anyway). I cannot check it now on Wikipedia since it is blacked out but the story as I remember (like Mr Drew I once taught these things) is as follows: the Republicans needed the approvals by the Southern states to get it ratified. They could not count on new states in the West because surprise, surprise, staunchly unionist and ex-abolitionist California refused to approve because with foresight they assumed it may make the Chinese eligible for citizenship. Ohio actually approved in the first fast bunch, but as Reconstruction was giving votes to blacks in the South and turning them Republican, with a bunch of them approving the Amendment, Democrats and moderate Republicans in a few Northern states wanted to stop the amendment by claiming states rights had been violated and that this gave them the right to withdraw their assent. Nullification or something. As the “quorum” had been reached, both Ohio and New Jersey officially withdrew their approval, in the case of New Jersey even against the veto of the Governor, who claimed the withdrawal was unconstitutional. I seem to remember that on the same day when the New Jersey legislative overruled the veto, or on the same day Ohio and New Jersey officially announced their withdrawal in Washington, DC, two more Southern states voted their approval, making the question whether the withdrawals were at all possible, moot (=”mute”in Birfer English). Of course, a number of startes quicly followed suit, making it even mooter. All the states in existence at the time have since then retroactively approved the 14th Amendment, even California and New Jersey. Very late in the case of Ohio, again probably because of oversight. though it is still arguable whether New Jersey and Ohio actually had the right to withdraw. So the exact dates when the two approved are disputable. And that is the only ratification problem with the 14th amendment. Bill DuBerger: but then they discovered “layers”…and they were off and running…again. I’m sure even with a properly flattened hi-res 10 megapixel image, the birthers would’ve found something to babble about. If anything, the last resort would’ve been “since we can’t find anything, it means it was created by the nation’s best forgers at the CIA”. That language is actually the rule permitting PHV. PHV is a motion to practice in an single case before a court in which an attorney is not admitted. Most jurisdictions (at least every jurisdiction I’ve dealt with) require there be a sponsoring attorney who is admitted. Doesn’t look like that is even required here (but I’m really not motivated enough to look it up…sorry Orly, you’re not that important to me). If there is a requirement for local counsel, I’d be courious as to what sad sack attorney would want his name associated with this crackpot. If anybody can find a case he won, I’d be interested. But I couldn’t find them listed at IRS? I do recall something about a state or two reversing approval, and that is still controversial. I don’t remember Ohio being one of them, in fact I understand that they were the State that got it over the line (curse you SOPA/PIPA I want to verify that on Wikipedia which has an excellent history of its ratification calendar) I am pretty sure that the only Ohio objection was that it wasn’t really a state, and that only became an issue when the problem was discovered in the 1950’s. In any event, I agree, the issue is moot because even if you discount Ohio and the states that did reverse their approval, at the end of the day (that’s not a cliche in this case) that the last state required (Ohio or other) there were already more than enough ratifications. Paul Pieniezny: And that is the only ratification problem with the 14th amendment. Of course, the 14th is valid and of course Ohio is a state. Otherwise, what exactly is that chunk between Pennsylvania and Indiana? Even if there had never been a 14th Amendment, I dispute that that would mean Scott is still the law of the land. The idea that precedents, no matter how wrong, are inviolable is incorrect. Precedents are due respect and deference and should not be overturned lightly, but they are not absolute and can be overturned for valid reasons. And I would say that a civil war in which 500,000 or so died is a pretty valid reason to overturn a Supreme Court decision. So, how would the Wong court have ruled in the absence of the 14th? IMO, they would have been perfectly justified to ignore Scott and support the common law and traditiion in England, the Colonies and the early days of the US which was that all those born in the country were citizens, except the children of diplomats. Like the Dred Scott decision? Most of the results of googling “Ohio New Jersey 14th amendment” seem to refer to voiders’ or even birfers’ sites, but that one should be legit. Though they seem to be convinced withdrawal was allowed. I did not know that Democrats in Oregon also tried to deroute the Amendment, by the way. Post-mortem, as chess players would say. And of course, many more states approved after the quorum line had been passed TWICE. The technical term for taking back approval of an Amendment seems to be “rescinding”. Although Oregon’s rescinding order expressly says that the 14th Amendment was illegally reatified some voider sites keep saying that Oregon actually rescinded before July 28, 1868. However, communications were slow in those days and perhaps the Oregon legislative thought that Washington had declared the Amendment ratified two weeks earlier. That would mean the 14th Amendment only became law when Virginia ratified in 1869 (they were not much in a hurry anymore, of course). There is no Constitutional provision for recission of an Amendment. When Judge Malahi rules against the “plaintiffs” you will hear them cry that the Obama Machine got to him. Should he say something along the lines of President Obama is a natural born citizen then they will say that an ALJ doesn’t have the authority to make that determination. It’s a lose/lose situation because these people will never be satisfied. If I understand the procedure correctly, the judge won’t actually issue a ruling. I believe that the judge issues an advisory and that the final decision about whether to remove the candidate from the ballot is left to the Secretary of State. Someone who has looked into this more closely might want to chime in. Correct. The only way to remove a Constitutional Amendment is with another Constitutional Amendment. See: Prohibitiion. That Other Mike: There is no Constitutional provision for recission of an Amendment. The Magic M: I’m sure even with a properly flattened hi-res 10 megapixel image, the birthers would’ve found something to babble about. “Kerning” was always in their back pocket. Bill DuBerger: “Kerning” was always in their back pocket. Allergic to that word, now, not that I like it before–an irritating daily task made worse by a bunch of nuts abusing technical knowledge! And you’re right, birtherism will simply go on. That’s the most irritaing thing about conspiracies, unnecessary questions can always be invented! Just add a new level, one that “explains” the new obstacle, and keep on a’birthin’! It will until Obama is gone, and then the mindset will reform, latched onto a new target with a new theme. Haters can always find somebody. I saw some blog entry (from South Carolina) where someone is claiming that Judge Malihi supoenaed President Obama to appear in court. Didn’t mention that it was via a pre-signed form filled out by Taitz, nor the issues that a judge doesn’t really issue them but the parties, nor the unenforceability of Georgia subpoenas outside of the state or against federal officials. By the way, I did see something in Hawaii law that mentioned that subpoenas would be signed and stamped, but otherwise given in blank to the parties. I don’t think that’s unusual, but what kind of sanctions could there be for abusing them the way Taitz has done. J. Potter: And you’re right, birtherism will simply go on. That’s the most irritaing thing about conspiracies, unnecessary questions can always be invented! Just add a new level, one that “explains” the new obstacle, and keep on a’birthin’! It will until Obama is gone, and then the mindset will reform, latched onto a new target with a new theme. Haters can always find somebody. Correct.The only way to remove a Constitutional Amendment is with another Constitutional Amendment.See: Prohibitiion. Agreed, but I wasn’t completely clear – there is no provision for recission of ratification of an Amendment. In other words, no backsies. Obama’s lawyer has filed a Motion to Quash re the subpoenas. It’s far from word perfect and probably could be improved but gets the job done and has a good swipe at Orly’s disregard for customary subpoena process in passing. It looks he wants to be sure that her shenanigins are known to the judge before the hearing. I don’t know what sanctions, if any, she could face. Rickey: If I understand the procedure correctly, the judge won’t actually issue a ruling. I believe that the judge issues an advisory and that the final decision about whether to remove the candidate from the ballot is left to the Secretary of State.Someone who has looked into this more closely might want to chime in. Seems to be for sure a case of issuing an advisory to the SoS who makes the decision. Those with knowledge of previous cases that are anywhere near similar seem to anticipate that the SoS is highly unlikely to proceed in a way that is against the advice of the ALJ, whatever that advice might be. Of course even a SoS decision that goes against Obama being placed on this ballot would in isolation ultimately be pretty much irrelevant to the issue of him becoming the Democratic Party election candidate. The manipulation of the document evidences a conscious attempt to use the authority of this agency [to] acquire documents that the attorney would otherwise be unable to obtain, especially since discovery is not allowed. BOOM! I love how he points out that Orly is fraudulently abusing the use of these subpoenas, all on her own accord and without the proper permission and authority to do so. Judge Mental: Obama’s lawyer has filed a Motion to Quash re the subpoenas.http://www.scribd.com/doc/78681437/Georgia-Farrar-v-Obama-Defendant-s-Motion-to-Quash-SubpoenasIt’s far from word perfect and probably could be improved but gets the job done and has a good swipe at Orly’s disregard for customary subpoena process in passing. It looks he wants to be sure that her shenanigins are known to the judge before the hearing. I don’t know what sanctions, if any, she could face. Paul Pieniezny: Most of the results of googling “Ohio New Jersey 14th amendment” seem to refer to voiders’ or even birfers’ sites, but that one should be legit. Thanks for those links. I stand corrected. I still contend that by the time it was promulgated, other states has ratified it so the rescissions of Ohio and New Jersey made no difference, valid or not. 9 July 1868 – Virginia becomes the 28th state to ratify the amendment if the Ohio and New Jersey rescissions are not valid (or 26th if they are valid). 13 July 1868 – Alabama becomes the 29th or 27th (depending) ratifier. 20 July 1868 – SoS Seward told Congress that if the Ohio and New Jersey rescissions are not valid, the Amendment has been ratified by sufficient states. 21 July 1868 – Georgia becomes the 30th or 28th (depending) ratifier. 28 July 1868 – Seward declares the amendment adopted whether the recessions are valid or not. Or in fact whether Ohio was even a state or not. It makes no difference. On 28 July 1868 there were either 28, 29, or 30 States that had ratified the amendment no matter how you count it. As 28 is the number required, its ratification was and is valid. End of story. Any thoughts from the lawyers (and others) on whether Democratic Party v. Wisconsin ex rel. La Follette or California Democratic Party v. Jones would have any bearing on the hearing (or later if the Judge recommended they disqualify Obama)? Since most of the challenges are decidedly not members of the Democratic Party of Georgia, could this be seen as interference with the rights of association as mentioned in these cases?